You can use the Batch Close feature in Work Order to close out up to ten work orders at the same time. To maximize the reporting capabilities of Work Order, it is important to be sure the work orders you close are not missing key information such as Craft, Purpose Code, Budget Code, etc. You can utilize the Advanced Search feature in Work Order to quickly find work orders with missing information by selecting the --Blank-- filter found in many of the search criteria boxes. This will allow you to easily find and fix work orders before batch closing. To batch close work orders, click on the Work Order link under the Information Analysis section on your home page. Hover over the Shortcuts drop down menu and click on Batch Close Work Orders. By default, the system will filter the list to show only Complete status work orders. If you would like to batch close work orders of a different status, you can select it from the drop down box in the Filtering section above the list. 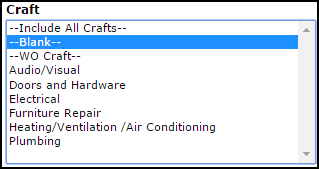 You can also filter the work order list by purpose code. The page loads 10 work orders at a time. The check boxes under the Close? column will be selected by default. The check indicates that you would like to change the status of that work order to Closed. If there is a work order in the list that you do not want to close, remove the check from the box. Click the Submit button to close the selected work orders. The screen will refresh to show the next 10 work orders in the list. Repeat the steps until you have closed the desired work orders.